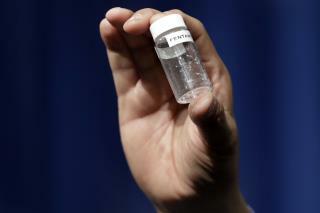 (Newser) – Fourteen people overdosed on heroin laced with fentanyl in a span of just four hours Wednesday in Camden, New Jersey, NBC Philadelphia reports. While none of Wednesday's overdoses in Camden were fatal, BuzzFeed—citing new data from the CDC—reports fentanyl and other synthetic opioids are now the leading cause of overdose deaths in the US, having killed more than 21,000 people last year. One epidemiologist calls those numbers "shocking." Fentanyl is about 50 times stronger than morphine and 10 times stronger than heroin. Researchers say the increase in overdose deaths—a jump of 21% between 2015 and 2016 driven by fentanyl and synthetic opioids—is likely due to people buying heroin or counterfeit pain pills and not expecting the spike in potency. The DEA crackdown on regulated, safe pain pills if taken responsibly is why we now have the drastic rise in heroin and fentanyl. Say no to legal drugs. Doesn't surprise me. I had a fentanyl script for severe pain control years ago. No other drugs even touched that pain, but fentanyl did the trick. Problem was, the drug was so powerful, I could only use it for a few days, and my pain lasted for over a year.